Buy a Phone Case Here! My artwork + your phone case = love! Just click the black box up there. I'm particularly grateful again to Cliff Etzel who visited me again a couple of weeks ago to get some final photographs for this great photo / audio piece he made about me. While I'm always a little self conscious about these types of things, for the usual reasons, I think Cliff did a lovely job of capturing the essence of my work and the processes that I use to arrive at the final pieces of work. In the meantime I'm starting to gather pieces and new work for a First Friday Artwalk show in Downtown Eugene in May! I'm really excited about it and am grateful again to Yankee Built for their gracious invitation to show in their beautiful and simple show room. I'll have more details soon, but for now I hope that Spring is peeking out and warming up your neck of the woods. Some of you may know that one thing I've been doing since the beginning of the year is working on finishing a bunch of work that I've started but haven't completed. My mother, who is a quilter and fabric artist extraordinaire (she is French after all) calls these types of things "UFO's" - or Unfinished Objects. I love this term - it's so kind of nerdy and yet totally un-judgemental about work that creative people start and then get stuck on for whatever good reason and abandon... for a while. I have lots of these, actually. I'll get inspired by whatever, get a wild hair, and then for any of the following reasons, move on to something else. 1. I don't like where the piece is headed and I'm not ready to push through to find out where it goes. 2. I started too many things and got some of them done, but then I had to do a lot of _________ (fill in the mom/work/domestic duties blank) and had to stop until later. 3. Bigger pieces for a show or commissioned work took priority. 4. The piece needs a lot of time and love and attention and I want to complete more things more quickly...so it has to wait it's loving turn. 5. Etc., etc. Everyone has very legitimate reasons for putting things off - and I don't consider them excuses - just explanations of a path or paths taken if they're necessary. SO -- This year I'm really focused on finishing a lot of these "UFO's" so I can emotionally and physically clear the decks for more focused and better work for the rest of the year. So far it's going pretty well! And I'm realizing that in many cases I'm now a better artist than when I first started these pieces so they're coming out a lot better than I ever imagined. Which is, actually, just a beautiful gift for me and helps the work be so much richer in the end. My plan is to continue this effort until my work space is much cleaner! There's a great deal of pleasure in this clearing process and, as usual, because it creates a lot of space and clarity for new ideas and creative thinking. Breathing room might be a good term for it too. In any case I'll continue to post new work as I complete it and ideally these efforts will turn into parts and pieces of new shows and new work for sale. Hey well, lucky me! I was visited this week by the lovely Mikayle Stole who curates the Seen Eugene Facebook page and Cliff Etzel of Lane County 360. Mikayle's Seen Eugene is a great page where you can follow all things arts in Eugene and Springfield. Mikayle was inspired to start the page with the seemingly dwindling coverage of the arts by our local more traditional media resources. She does a great job covering a huge variety of events and artists of all types in community. We've been talking about her coming to interview and photograph me and my work space (read Dining Room) for a couple of months now and it finally happened on Friday! Local photographer Cliff Etzel joined her. He's also a host of a web page called 360 Lane County where he showcases a variety of scenes and photography from the southern Willamette Valley. Wine, fishing, theater, you name it - he does a little writing for each photograph and posts it. Mikayle and Cliff came to visit my 'studio' and talk to me about my artwork, what I'm inspired by, and what's up with my work lately. I'm excited for a little local exposure and it's refreshing to talk to people about my space, the artwork I have up in the house, what keeps me going, how I find time for it, and where I'm headed with it all. If you click their links above, you'll see that I'm featured in one way or another this week! My chatting with Mikayle and Cliff made me realize that I actually surround myself with inspirational work including books, fine art, kid art, photographs, music, garlands, sculpture, dishes and probably all kinds of other stuff. AND I'm looking for it all the time!! Ultimately aesthetics seem to play a part in most of the decisions I make on the daily. Yes, it seems relatively obvious now that I'm writing it, but being interviewed about it certainly brought it more forward in my mind. So - check out the links I highlighted above and be sure to like, comment and share if you like what you see! In this digital world it's what makes us all thrive a little more in this space. With lots of thanks again to Mikayle and Cliff for their interest in my work, for taking such nice pictures, and putting them up in their respective on-line forums. Hello internet-sphere! And welcome back to the Orange Sweater Design / Emily Proudfoot Blog. I am very happy to have arrived in 2017, despite and perhaps because of the crazy ride that was my life in 2016. While all of us here at home are most certainly and gratefully healthy and happy, 2016 was so full of intensely emotional events that I ended up taking a year off of blogging. This is not to say that I wanted to or intended to do so - but there was so much travel, immensely joyful events and equally tragic ones around us. It left me with little energy to write much outside of my journal - or have the desire to share any of what was happening. Nor did it mean that I stopped painting and drawing. In fact I feel like my artwork reached new levels of quality and richness that I don't think I could have imagined. I had several commissions, sold a lot of work, and was really grateful for all of that - particularly the time to create. So I am back. And I am back with real intention to devote time to this blog space much more frequently this year! For the last three years I have chosen a word for the year - in 2014 it was Muse. In 2016 it was Move. And now, here in 2017, my word of the year is WRITE. I have lots of reasons for this - many of which have to do with the fact that I wrote an immense amount last year, mostly in my own journal, and it was hugely helpful in my navigation of a ton of change, joy and pain in my life. But another very compelling reason for this choice is that I want to spend more time writing here. I want to be more consistent about sharing my work with writing included. I want to try and talk about my motivation for my artwork, what's inspiring me, and what I'm trying to work out. Am I just doing it so I have work for shows? Or do I think it's beautiful and pleasing? Or that it's important in bringing joy and beauty into the world? In some way, I hope that writing here brings a level of understanding and accountability to my work that maybe I haven't had before. And so, I'll be sure to let you know when something gets posted. Look for Facebook or Instagram updates. Maybe I'll even start a little newsletter this year - who knows. In any case, I'm excited to start posting here again on a regular basis with chronicles of daily life, art, farm, food, friends, and whatever else strikes my fancy. With a million thanks to everyone who has been following me around for the last few years - Happy 2017 to all of you with a big dose of love and gratitude. Wow! January is almost over, so I thought I'd better post a few more of these pear drawings before we launch in to February (and a new word) on Monday. I've been having a great time with this subject and have tried out lots of different ways to represent one thing. My favorite may be this stamp I carved last weekend - it just came out so perfectly blocky - and yet it's so clear what it is! I stamped a bunch on thick paper and handed them out as little treats at work. I spent Friday night this week trying out a variety of water-soluble coloring methods that I have in my art supplies kit. Water colors, ink, water soluble crayons, gouache, etc. While I'm not wild about the results, it was still fun to play around with how these materials work - and how they work together. I was going to just stick with one medium for each pear. But then I just ended up using them all here and there. Which I think is more successful anyway. And then last but not least, I've been plunking away in my sketchbook which has been including a lot of pears. Overall I have found this to be a most pleasing exercise. And I could have done so much more with it, but given time and so many other competing interests - here we are. Well, now that the New Year is well underway, I was thinking about ways to keep content on the blog engaging for both me and the readers. I'm ever-inspired by one of my very favorite artists Lisa Congdon who is, I believe, the queen of consistency and challenging herself to new things via her blog. Among many other projects, she's documented her collections; written something in different handwriting and posted daily for a year; and challenged herself this year to a painting a week in blue. So I've decided to pick one subject for each month and try new ways to draw, paint, scribble, doodle, splat, collage or do whatever with that thing. January's subject, as you may have already figured out, is PEAR. I've started out the easy way - drawing the way I know how to draw. Generally very graphic and blocky at least in my sketchbook. I did try that scratchy kind of thing (up above) which while not brilliant, was still fun to do and I learned a little something. I'll certainly try out some tutorials and share them and the results with you here - and I'll just see where it takes me. And then I've picked some things that I think might be really hard to draw, but it will be an exercise in exploring new territory and subject matter. It will get me to dig deeper and push myself to be a better artist in lots of ways. SO - I won't give you the list for the whole year because it will be more fun if it's a surprise and I might change my mind on some things part way through. 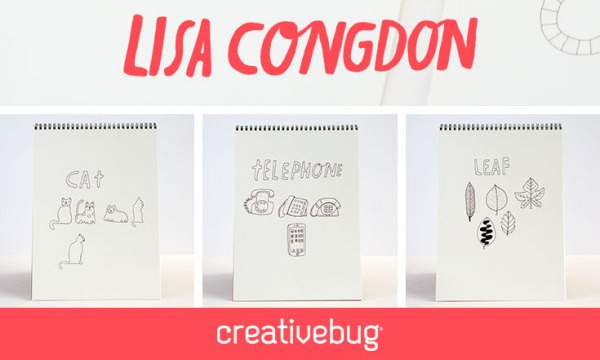 But I will say that after I made the list, I saw Lisa's 31-days of Drawing on CreativeBug and had to chuckle at how many subjects I had actually picked that were in common with her list. I love these little examples she's shown and I hope that this exercise I've set up for myself pushes me into new ways of thinking, drawing and working that I haven't done before. In any case, stay tuned. This should be good. Hello! You've successfully arrived at the new Orange Sweater Design website blog! I'm really excited to have this new platform where I'll be able to easily showcase my most recent work; display work in process; and even offer my available paintings up for sale! I hope you'll come back and visit often as I'll be looking forward to keeping things fresh and up-to-date on a regular basis. In the meantime, please feel free to look around as there are several new pages you'll be able to peruse easily, including 'Day to Day work' showcasing my work in process; 'Available Artwork' - pieces for sale; and 'Latest' which will show my most recently completed pieces. A joyful summer-like snippet to keep things fresh in these winter months. I think you'll find the look more fresh and relevant, which is great for an Artist's website. For my part it will be much easier to consistently update imagery, keep the website looking great, and blog on a regular basis without as much time and effort involved. And with that I'll send out a giant THANK YOU for stopping by and the three years of support you've given me so far. Happy New Year!